When they said that robots were coming for our jobs, they really meant all kinds of jobs. 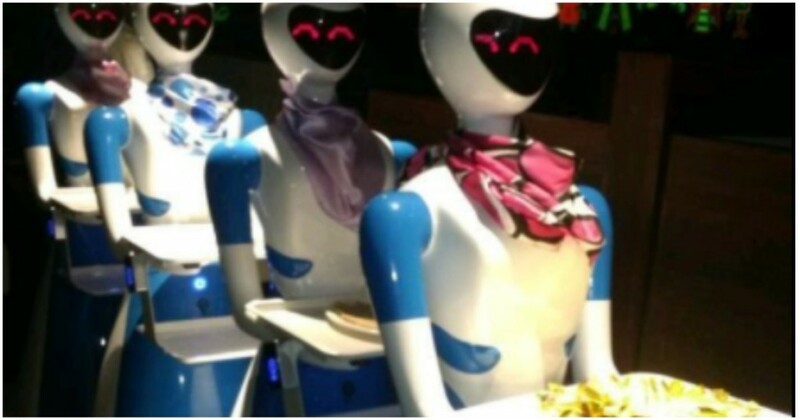 A restaurant in Chennai now employs robot waiters to serve food to its patrons. The restaurant, called Robot and located in Semmancheri, is built around a Robot theme with neon lights, robot displays, and in a strange tech-pop-culture mashup, a robot sitting on the Iron Throne. The crowning grace, though, are the faceless robots who glide around the restaurant and bring food to tables. The robots can’t take orders from customers yet, but Robot has a suitably high-tech solution — each table has an iPad through which customers place their own orders, which are automatically sent over to the kitchens. Once the food is ready, it is brought to the tables by one of the four robots. The robots are a hit with kids, and also a top selfie attraction. This isn’t the first time technology has found uses within the food industry — in San Francisco, small six-wheeled robots deliver food to homes, and a startup called Zune has been using robots to make pizza with minimal human intervention. Robot restaurant’s waiters aren’t exactly cutting edge — they’re guided by a human operator, and can’t yet take orders — but they represent what dining could well look like in the near future. Customers appear to have taken to the concept, and reviews on Zomato are uniformly gushing about the robot waiters. There are certain benefits to having a robot waiter too — there are no misheard orders, and thanks to the technology, no wrong dishes are likely end up at your table. But the concept, while undoubtedly cool, raises an ethical, moral and possibly existential question — does a robot waiter expect tips?